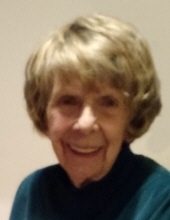 Shirley Scaravillo, 92, of Camillus, passed away peacefully Saturday, February 2, 2019, at home surrounded by her family. A lifetime resident of the Syracuse-Camillus area, she was happiest spending time with her family. Shirley was predeceased by her beloved husband of 58 years, Vincent "Jim", in 2007; five sisters; and five brothers. Surviving are her son, James Scaravillo; and daughter, Diane (Jeffery) Rodeghero, both of Camillus; grandson, Matthew Scaravillo; and several nieces and nephews. Relatives and friends may call Tuesday, February 5 from 5 to 7 p.m. at the Buranich Funeral Home, 5431 W. Genesee St., Camillus. Shirley will be laid to rest in Onondaga County Veterans Memorial Cemetery. In lieu of flowers, contributions may be made to Hospice of CNY, 990 Seventh North St., Liverpool, NY 13088. To send flowers or a remembrance gift to the family of Shirley Scaravillo, please visit our Tribute Store. "Email Address" would like to share the life celebration of Shirley Scaravillo. Click on the "link" to go to share a favorite memory or leave a condolence message for the family.